My first Space City Comic Con was three years ago, back in 2013. I had a super time spending the day checking out all their was to see, as well as meeting the majority of the special guests that had appeared. Two years later (2015) and I was back at it again. Instead of one day, I spent the entire weekend there. Reason being so I could cover the event for the classic rock station I write for. Ended up being quite a task. My main focus, was on the live music Space City Comic Con 2015 had to offer. One guest in particular, Tim Russ. Most know the name from the television show; Star Trek: Voyager. Besides his acting, Tim is really a very talented musician. I had the pleasure of interviewing him before the convention about a new CD he had at the time, just put out called; Tim Russ – Lifeline. I enjoyed the task of reviewing the CD, and wanted to go a step further with it. Tim was all too happy to oblige. 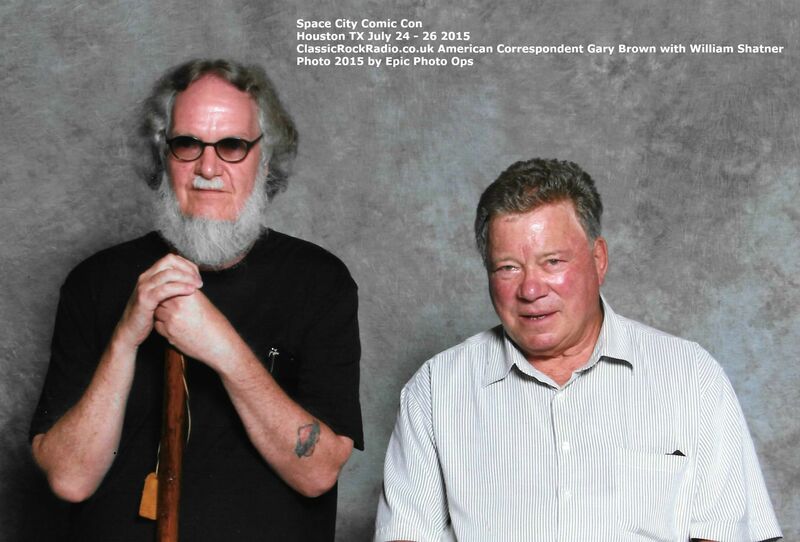 I then picked up on the fact that not only was Mr. Russ going to be a special guest at Space City Comic Con 2015, appearing with several other actors from the Star Trek show he did, but that he was also going to be a musical guest there. Seeing how I review music concerts as well, it just seemed a given that I be there. And that I was! In my opinion, things could not have worked out any better. The response from all the pieces I wrote, not only on Mr. Russ, but on my experiences at the convention, amazed me. For myself, it was a really cool writing experience. I thank all who made it possible. To those who assisted, and to everyone else who found the free time to hang out, and shoot the bull with me some. Seeing how Space City Comic Con 2016 is getting near (May 27 – 29), I figured I put all my stories together that I done centering around last years mega successful Space City Comic Con, and again let them fly. I know there are some are out there reading this now, that are not one hundred percent sure if they are attending or not. So this re-posting, for those on the cusp. A gentle nudge to push one in the right direction of good times, and everlasting memories. As for myself, I wish I could attend. Things have a funny way of changing over the course of one year. For this Space City Comic Con, instead of driving in, and going home at the end of that day’s events, I would have to fly in, rent a car, and crash at a nearby hotel. Two words explains it all; separation / divorce. As ugly as that is, my friends tell me I’m all the better because of it. So not a bad thing. A life lesson to pass on; don’t take anything for granted. As it pertains to Space City Comic Con 2015, the special guests you have an interest in seeing this year, but are thinking you might pass on till the next time around, could have other obligations preventing them from making it in 2017. Events could change. Items you might be interested in obtaining, purchased by someone else. Catch my drift? Believe me, this year’s Space City Comic Con, will be unique in it’s own way, and the only way you will have the opportunity to experience it, is to be there. Even if it be on a shoestring budget. Just do your best to make it happen. And to all who have already made plans on attending … enjoy! OH, and should anyone have contact with William Shatner, please pass on that I’d still would love to interview him on his music. Seriously! I enjoyed his last album (William Shatner – Ponder The Mystery), and I am also a big Billy Sherwood fan, who helped Mr. Shatner on that project. 04.) Space City Comic Con 2015 – Chapter 4 – It’s A Wrap! Can You Spare A Little Cash For An Old Altar Boy? Hope U don’t mind me passing the basket but writers need money too. Please take comfort in knowing that any and all cash donations collected will go towards paying the bills; Rent, internet, cell phone, website, coffee, various juices, munchies, and whatever other costs that are associated with this creative side of my personality. No matter how small, any contribution is more than welcome, and always very much appreciated. If serious, I can get U Discounts on advertising opportunities with Classic Rock Radio (UK), or Glass Onyon PR. All U have to do is tell me that you are indeed interested. No obligation. Look for the contact page on this very website, send me a message, and I’ll gladly help set you up. If interested in talking to me about my helping with a Twitter page, let me know. Take a look at mine. If not anything else, shows sales experience. With a little dedication and focus, YOUR page could ROCK. Drop me a message and I’ll get back to you. OH…I do charge a small fee. Done via PayPal (secure).